WASHINGTON -- Halloween is almost here. So, do you believe in ghosts or don't you? Either way, there's a tour in our area where you can get an open-minded, yet fact-based take on the topic. Keeler Hunt, a paranormal investigator with a science background, is vice president of the Virginia Scientific Research Association (VSRA), which was founded to try to debunk unexplained events. But there's something else you should know about Hunt: she sees dead people. Hunt describes herself as an "empath," someone who can pick up on people's feelings whether they're alive or dead. "I sometimes see electromagnetic fields around somebody, and it looks like heat coming off an Arizona highway," she says. Hunt says there are three types of ghosts. Sentients, or living ghosts, are rare. Others are called "caspers" because they are extremely friendly, sexual ghosts. Finally, there are the residuals. Hunt says a residual is a memory left by a living person who experienced an emotional event, most often a terrible one. Hunt says science can't explain it yet, but the memory is left hanging in the air in a particular spot until someone who is sensitive to electromagnetic fields steps into that space. Then, the memory plays like a re-run on a TV screen, she says. 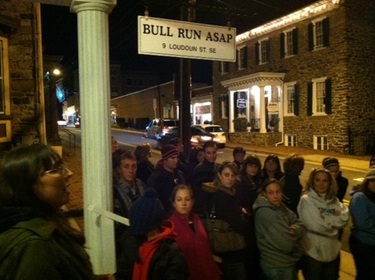 In addition to investigating strange events, Hunt leads nighttime ghost tours in downtown Leesburg. On a recent night, Hunt led a tour group of about 30 people along King Street. "There are hundreds of spots up and down this street that you walk through every day that are haunted," she says. Hunt says many ghost stories she investigates turn out not to be entirely true. For instance, many believe the Loudoun County Courthouse is haunted by the ghost of Mercer, a teenage slave who was hanged and quartered after killing his owner. In fact, the courthouse was in a different location when Mercer was executed, says Hunt. Hunt says the story is not true, but she does think the old wooden furniture in the courthouse is haunted because of the many people who have gone through the emotional experience of being in court. Hunt says out of 140 reported hauntings downtown, VSRA has debunked all but 42. She says she's seen some creepy residuals, but Hunt has never met a sentient she didn't like. For example, she says there's a large man who haunts Room 4 of the Colonial Inn. He stands over the bed. "If you see him, say 'Hi Eugene,' because he's a friend of mine," she says. "Offer him a shot of tequila (and) he'll love you forever." Near the end of the tour, on the courthouse grounds, the brave get a chance to touch a ghost. A woman named Melissa tried it. "I felt heat," she says. "I felt like I was actually touching something." "I felt a sharp needle in my middle finger," says 12-year-old Ellie. Jaelen, 7, says he experienced something too. "It was kind of like the tree was a magnet and my hands were a magnet, and they were coming together," he says. Some people who tried it said they didn't feel anything. The final Leesburg Ghost Tours of 2011 are scheduled for Friday, Saturday and Halloween night. Get ticket information here. Follow Michelle Basch and WTOP on Twitter.